14 kms north east of Rawalpindi on the north eastern fringe of the Potohar plateau of the province of Punjab. Northern latitudes 33o 49' and longtitudes 72o 24' east of Greenwhich. Lying at altitudes ranging from 457 to 610 metres. 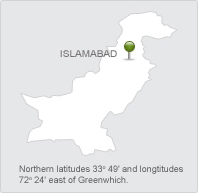 The area of Islamabad is 906.50 square kilometres. A further 3626 square kilometres area is known as the Specified Area, with the Margala Hills in the north and northeast. Islamabad city is divided into five major zones: Zone I, Zone II, Zone III, Zone IV, & Zone V. Zone IV is the largest in area while Zone I is the largest developed residential area. Zone 1 is divided into sectors. Each residential sector is identified by a letter of the alphabet and a number, and covers an area of approximately 2 km × 2 km. Islamabad features an atypical version of a humid subtropical climate, with hot, humid summers accompanied by a monsoon season followed by cool winters. Average yearly rainfall 1143 milimetres. Copyright © 2007-2017 Capital Development Authority. All Rights Reserved.